Did you know that Tom Cruise has been playing the character of Ethan Hunt for twenty-two years now? What began as the only decent adaptation of a television series has become a spy movie empire. Cruise has risked his life on numerous occasions; performing one death defying stunt after the other. He’s turned these impossible missions into a watchable anthology. Now let’s find out if the sixth installment is the best, shall we? Cruise returns as Ethan Hunt; a special agent for the IMF (Impossible Missions Force). When Ethan loses track of a dangerous quantity of plutonium in favor of protecting his crew, trouble comes a knocking. 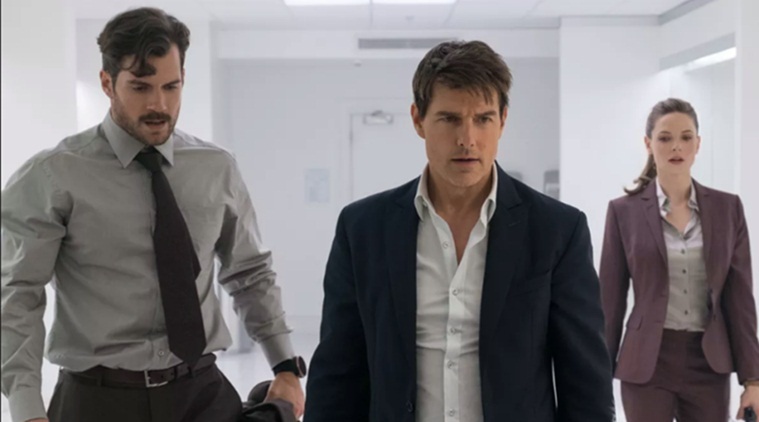 The CIA (Angela Bassett) issues them a handler named Walker (Henry Cavill), whose mission it is to bring back the plutonium, even if it means killing Ethan in the process. Now, Ethan and his crew must track down the dealer and perform the impossible....again. Problems arise when Ethan comes across his old foe Solomon Lane (Sean Harris) who knows exactly how to worm his way into Ethan’s mind. Will Ethan choose to accept yet another mission? A lot of people are saying this is the best film yet, and while it is very good, I still think the last film “Mission: Impossible – Rogue Nation” is the best of the series. On the other hand, I think we can all agree that “M:I 2” is the worst, and using it as a form of comparison is how one can judge the success of the other films in the series. Does it have bad slow motion? Nope. Does this film have a final battle featuring white doves? No not even a flutter. Well, then it’s one of the better films. "Mission: Impossible -Fallout" is the only film to include not only the same Director from a previous film, but the same villain. These films are the American equivalent of the James Bond Franchise. We have our Bond in the form of Cruise and now we have our Blofeld: Sean Harris. Cruise and Director McQuarrie are shaping this world for the better. It’s been six films so there’s only so much they can do to add new twists and introduce new characters. A lot of controversy surrounded this film for two reasons. The first was that Tom Cruise broke his foot whilst performing stunt, shutting down production. Even so, he continued with the scene and it made its way into the film. I mean damn... that’s commitment to your craft. Honestly, it’s been six films and Cruise always does his own stunts. It’s not surprising this happened. I’m actually shocked he didn't suffer worse. The other controversy was Henry Cavill's moustache. Paramount refused to let him shave it off because it was important to the film. I have seen this film and I have yet to determine what was so crucial about this extra facial hair. I love this franchise, even the redheaded stepchild that is the second film. I feel this film is one of the best entries yet. Cruise and company bring the action, the story is a great continuation to “Rogue Nation,” and most importantly, it’s a great spy flick. If you aren’t a fan of these films I don’t know if this will be the film for you. But if you like pulse pounding action and have a desire to see Tom Cruise risk his life while flying a helicopter...this is the film for you.